Blue Ribbon is a health and social care provider specialising in care at home. They operate a growing franchise with branches across the country. The Managing Director came to us for a complete identity overhaul to help promote the franchise and build the business. Blue Ribbon Community Care was established in 2005 after a merger with Calon Lan, a profitable care provider in North Wales. The aim was to build on their success and expand throughout the UK by franchising the business, with a focus on offering flexible home care. 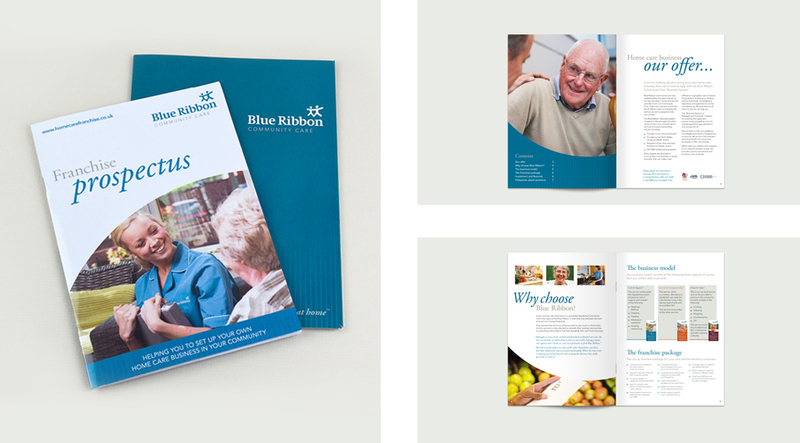 Our job was to evolve Blue Ribbon's visual identity to reflect professionalism and expertise. The company had built up a good reputation already, but their identity didn't match their values. As they were moving to a franchise model it was crucial to establish an identity that potential franchisees felt comfortable buying into. Blue Ribbon had built up equity in their name and paper chain icon so our job was to refine the mark and evolve the identity, rather than come up with a brand new concept. We added warmth to the corporate blue and introduced secondary colours, subtle textures and curves to make their marketing materials friendlier. The identity was rolled out across a number of items, including stationery, booklets, banner stands and leaflets. We also built a custom Wordpress site that could be updated and personalised by individual franchises easily.